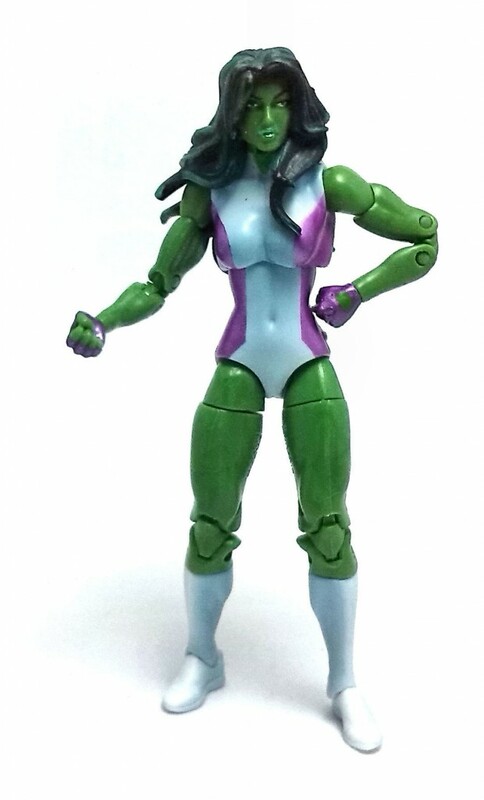 She-Hulk was one of the figures I was most curious about when Hasbro announced her inclusion in Marvel Universe Series 4. Of course, distribution being what it is, she was part of the wave of figures I never saw at local retail. Still, I managed to get a hold of one at a local bazaar, and I must say I am pretty impressed by what Hasbro did here. To start, She Hulk is an entirely new sculpture. For some reason, I suspected Hasbro would just use the newly developed female body, but as it turns out, only the feet molds seem to be re-used. She-Hulk’s overall body proportions are suitably muscular, without reaching the freakishly bulky physique of her cousin Bruce. I find the fact that she has a sculpted navel to be a little bit distracting but I guess it makes sense, considering that her body mold is fit to be reused in the future for other similarly endowed characters. The head sculpt also seems to be unique, although maybe it is just the coloring that makes it impossible for me to determine if the face has already been used on another character. On the other hand, the hair is a newly sculpted rubber wig. This has to be the most articulation Hasbro has ever had crammed into one female character in this line. 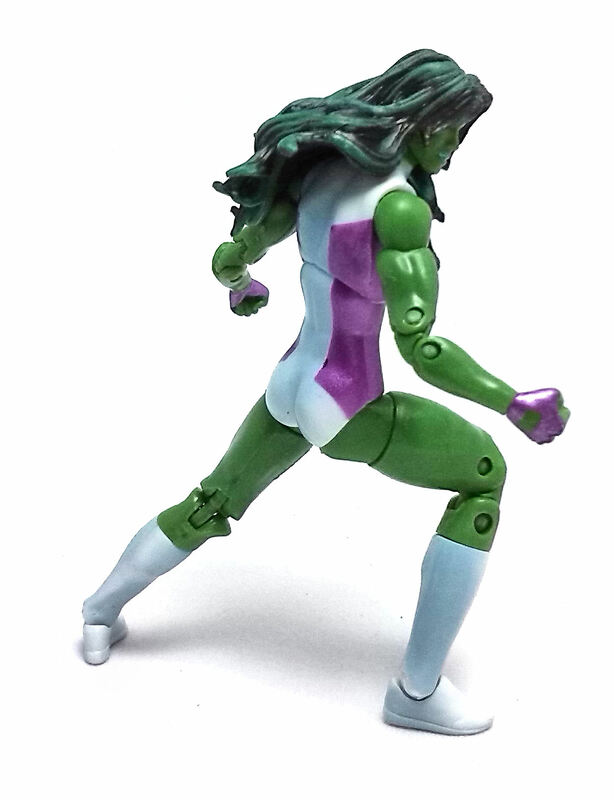 Granted, .the hair piece limits the range of movement at the neck, and the hips are only really useful to go up and down, but She-Hulk has enough versatility to strike a good number of poses. The figure comes molded in green and white plastic. The exposed skin areas are left pretty much unpainted, except for the facial detailing and the gloves. There is a very light shading airbrushed over the white sections of her costume, with metallic purple paint applications to the sides. The hair seems to have been heavily washed with black paint and then given a few highlights in bright green. 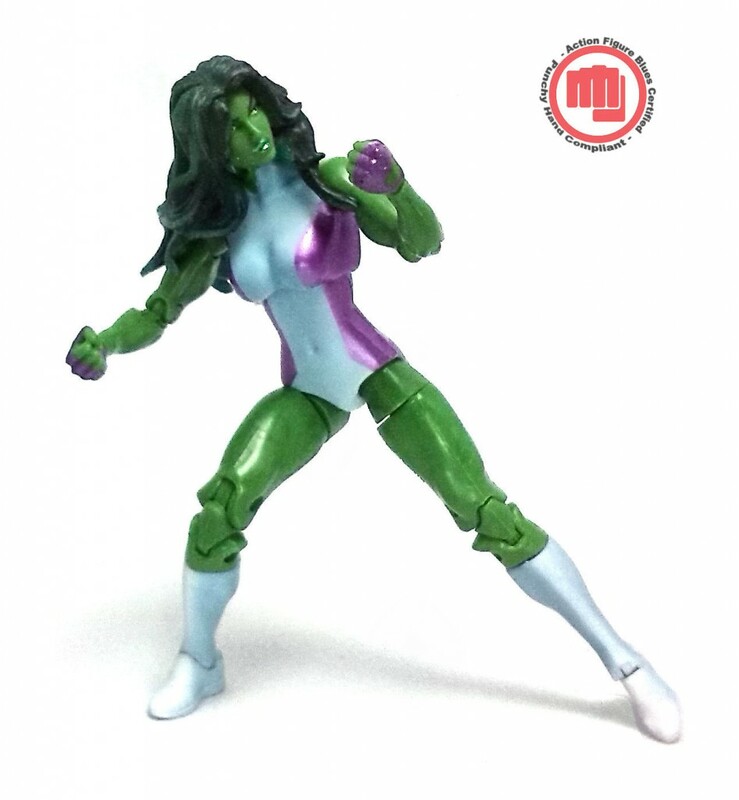 She-Hulk comes with no accessories whatsoever, other than the “collectable” piece of cardboard that replicates the cover of one of her comics. Even though I would have liked She-Hulk to have a little more mobility, I still think that she makes for a pretty respectable entry in my Marvel Universe collection.